Have you considered how bold vehicle graphics can connect with customers, all while you drive around town? Good vehicle signage is important for business, for a number of reasons. As a business owner, you will be driving around town daily or at least parked up while you grab a coffee. You may be running from client to client, delivering goods or services. 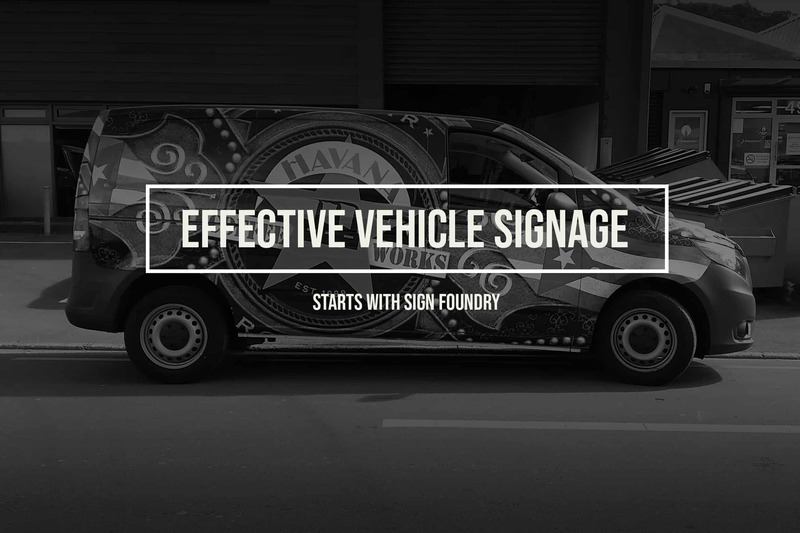 Whether you are stuck in traffic or cruising up SH1 to Kapiti daily, your car can market for you when you incorporate good vehicle signage into your business’s advertising toolkit. Put simply – this is a prime time to advertise your brand and create memorable impressions, all while you work. Here at Sign Foundry, we believe a bold vehicle wrap can be a crucial component of a signage branding strategy for your business. If you’d like to learn why, read on. One of the primary concerns of any marketing materials is visibility. Will the right people see this advert? Are memorable visual connections with the brand leading to people picking up the phone? The biggest asset good vehicle graphics can give your brand is visibility. While bad vehicle graphics may be poorly designed, with websites and numbers that are too small, or be visually uninteresting, good graphic design on your vehicle can communicate your brand clearly. Note Havana Coffee Works’ excellent visual graphic in the image above – no one would miss this vehicle on the streets of Wellington. This is a great example of where a considered design can transform a work vehicle into an effective, visible advertisement for the brand. We understand effective advertising to be advertising that sticks. It is, in a word, memorable. Let’s consider Havana’s custom wrap again. The Havana Caddy is highly memorable. It’s design is unique, the colour choices are bold, and the result is a stunning exercise in brand identity. While your brand may not be as graphically bold or vivid as Havana Coffee Works, you too can utilise vehicle signage to create memorable marketing materials. Custom vehicle wraps adorned with your branding give you a unique opportunity to communicate a call to action. 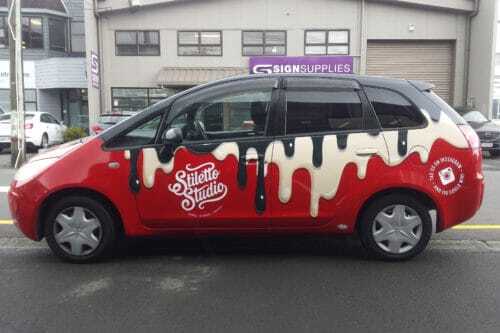 Phone numbers, emails, websites, special deals, or unique selling propositions can all be incorporated into your vehicle branding to help you stand out from the crowd. If you are wanting customers to take action immediately, you’ll need the right tools. That means phone numbers, websites or phrases which prompt them to action. The best marketing material reaches the widest range of people. The primary advantage of good vehicle graphics is the ability to turn your daily drive into advertising opportunities. As you drive around, you reach a maximum number of people – making an impression on a greater number of people than other forms of advertising. 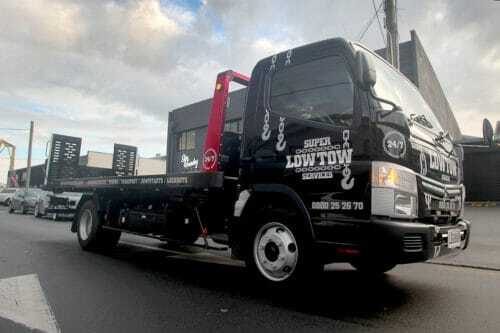 Super Low Tow – keeping things classy and effective. Consider a traditional newspaper advert. Or a billboard. These are expensive ways to reach your audience. Granted, they can serve crucial aspects of a marketing campaign due to their flexible, short-term nature, but they cost a lot. In contrast, vehicle wraps are cheap and have long service lives. They can serve as an important part of an awareness campaign, organically reaching a wide audience of potential customers. It’s clear that if you want to make a lasting impression on customers, you need to consider vehicle signage. Its ability to reach potential customers is unparalleled, and gives you an opportunity to make your brand come to life on the street. Check out our vehicle signage work here. 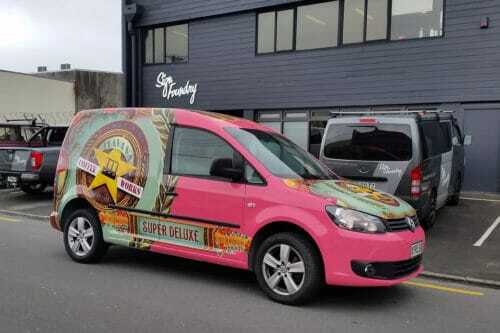 If you are considering vehicle graphics as part of your marketing strategy contact the friendly team Sign Foundry today, to talk about how we can take your visual advertising to the next level.